Rui Costa (Movistar) won stage 7 at the Tour de Suisse on Friday. It was the hardest day at the nine-day race, with four rated climbs on the map — including a brutal, 30km, hors categorie ascent of Albula Pass that peaked with 9.3 kilometers left in the 206km stage. Costa was part of a four-man group that jumped out front during the final descent into the finishing town of La Punt. He out-sprinted Bauke Mollema (Blanco) and Tejay van Garderen (BMC Racing) at the finish. The fourth rider in the group, Thibaut Pinot (FDJ), finished nine seconds back. “Our goal today was taking some seconds off the riders ahead of us in the overall and we didn’t just do that, we also won the stage,” Costa told AFP. Mathias Frank (BMC Racing) kept his lead in the GC standings. Costa is 13 seconds behind in second, while Roman Kreuziger (Saxo-Tinkoff) is 23 seconds back in third. American Joe Dombrowski (Sky) took the stage lead with around 10km left in the HC climb, and he rode hard up the steep road by himself as the gap between him and the peloton maxed out at around 35 seconds. He kept a high cadence and it seemed that he might be able to hold everyone off. But as the climb went on, a chase group of climbers and GC contenders emerged. Some attacks, like that of Michele Scarponi (Lampre-Merida), were eventually unsuccessful. 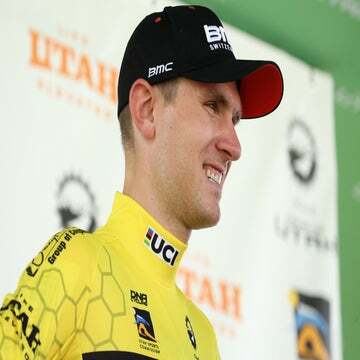 A group of four riders, however, was able to catch up to Dombrowski with less than 3km to the summit, and the newly formed pack of six riders crested the climb with a 19-second lead over the next group that included Andy Schleck (RadioShack-Leopard) and Frank. Dombrowski and Dan Martin (Garmin-Sharp) began to fall behind on the descent. The four leaders flew down the road, keeping a tight paceline as they stayed in the drops of their handlebars. Multiple switchbacks brought them down the mountain as they continued to stay ahead of everyone else. However, they were briefly held up by an inflatable banner that had fallen across the road at a hairpin turn with 2km left in the stage. As the riders braked hard, race officials and spectators rushed to hoist it high enough for them to pass under. They snuck underneath and kept riding down the road, which flattened out in the final kilometer. With about 500 meters left, the dash to the finish was on. Dombrowski and Martin were in the next group to cross the line, 22 seconds behind Costa. “Well, attacking at 25 k to go and riding into headwind may have been dumb, but after a week of crashing at least I gave it a go,” Dombrowski wrote on his Twitter feed. The race picks up with Saturday’s stage 8 before ending with Sunday’s time trial.